Not wanting to miss out on a very important event in the North American automotive calendar Kia came to SEMA with what seems to be a very playful attitude. I’m saying this because the Koreans prepared two versions of the Kia Sportage for SEMA that they called the Work and the Play. 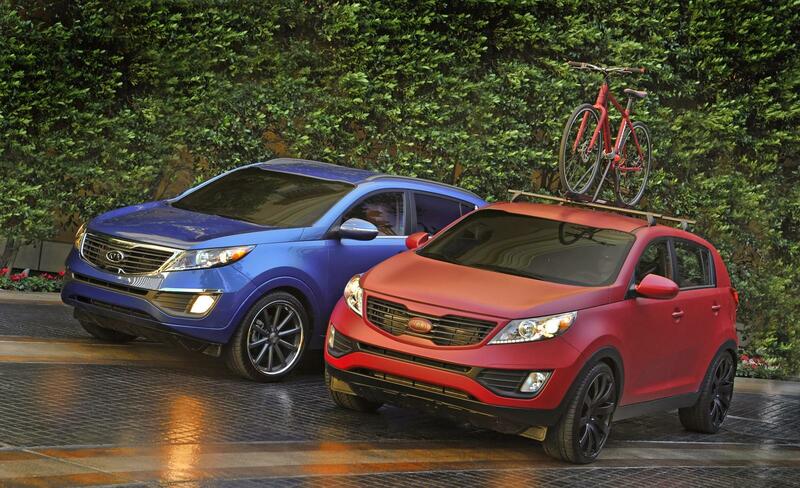 The two version of the Kia Sportage differ about as much as the name plates themselves. Starting with the less fun part (chosen only by personal preference of order) the Kia Sportage Work is supposed to be addressed for individuals that consider themselves sophisticated, tech-savvy, busy professionals. This target customer is so defined because the Kia Sportage Work has tan leather seats, custom carpeting and then you enter a pretty impressive list of toys, executive equipment such as a Memphis audio system, a Droid X docking station and a couple of iPads. That’s pretty “standard” custom interior work but the following additions don’t really make much sense for the user description. The Kia Sportage Work also has full closet and dressing station that offers up everything from electric razors to a shoe rack. That was slightly weird to find out, but happily you can get away from it and find the Kia Sportage Play somewhat more interesting 20-inch MRR HR4 wheels, a rugged matte paint and a Yakima roof rack. So the looks are pretty playful but the interior accessories don’t surprise as much as there is a 22-inch LCD television, a Mac Mini, a black leather upholstery, a suede headliner, and a Memphis audio system. This is all pretty standard stuff but here’s the cherry on top: the Kia Sportage Play has a motorized stainless steel barbecue grill.